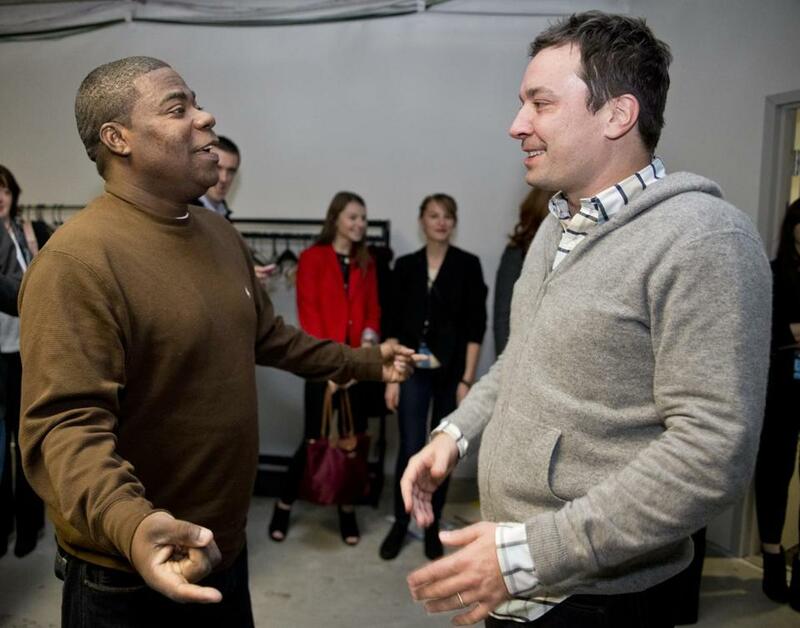 Tracy Morgan and Jimmy Fallon catch up backstage before “Comics Come Home” at Agganis Arena. Worcester superstar Denis Leary and Bruins legend Cam Neely had thousands of supporters in the audience at their annual Comics Come Home event, which benefits the Cam Neely Foundation for Cancer Care. 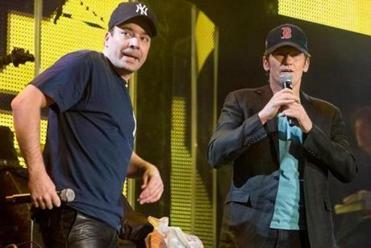 The lineup for the 19th annual show, which was held at Agganis Arena, included Leary, Jimmy Fallon (whose father went to the Neely House at Tufts Medical Center when he was treated for prostate cancer), former “30 Rock” star Tracy Morgan, John Mulaney, Robert Kelly, Tom Cotter, Gary Gulman, and Kenny Rogerson, a Boston-area guy who Leary said has done some writing for his new USA series, “Sirens.” It was an evening of mostly local material; Leary took on Bill Maher’s recent controversial comments about the Boston Marathon bombings and our city’s behavior after winning the World Series (he called the Fenway crowd a bunch of “champion [expletive] boozehounds”; Gulman talked about straight men who love Tom Brady; Mulaney, a former “Saturday Night Live” writer who has a show in development with Fox, talked about growing up around Swampscott; and Fallon and Leary sang a Babe Ruth-inspired Red Sox vs. Yankees duet to the tune of “I’ve Got You, Babe.” Fallon said backstage that he had dinner at Union Oyster House because it has his favorite chowder. World Series winner Will Middlebrooks was one of the VIPs at the after-party at Game On. Neely said that money from the Saturday night event will go toward the Marlene Neely Endoscopy Suite, named for his mom. Cam’s special guest for the night, besides his siblings, was longtime friend Michael J. Fox, who sat with him during the show.